Rare Gorham Narragansett Preserve Spoon 8 3/4"
Over the past 30 years we have had the good fortune of finding many rare flatware items but the pattern that remains in our minds as the most exotic and rare is the Narragansett pattern by Gorham. We recently found a rare preserve spoon which measures 8 3/4" long. There are numerous fish included is the applications to the central shaft among the other nautical creatures such as shells, crabs. clams and conch shells. These items are cast and applied individually and the detail never ceases to amaze admirers who examine the intricate handles. Gorham went to such lengths to make the spoons look realistic that they included tiny globules of silver "sand" in the design. This gives the spoons the appearance of having being removed from the ocean floor. 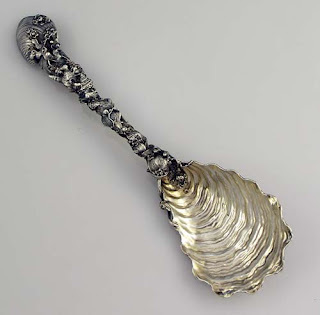 It is as if the spoon had been lying at the bottom of the ocean and the result is the encrusted look and feel. No wonder every silver collector who understands what Gorham was trying to do wants to own a piece of Narragansett. I remember being fussy and turning down large pieces of Narragansett pattern because the Gorham hallmark was not visible. I think this was a mistake because the marks were probably lurking somewhere beneath the shells and fish and seaweed. Some pieces are marked in the bowl of a shell at the terminal but most have the Gorham hallmark on the central shaft together with the sterling mark. Recently I found Gorham date letter for 1884 which really was exciting. This tells us that the Narragansett pattern was definitely made in the hollow ware department at Gorham and also that it was a really early example. It had great weight and proportion.